A screenshot of the online version of a satirical edition of The Washington Post distributed around Washington, D.C., by political activists Wednesday. "UNPRESIDENTED," reads the giant headline. "TRUMP HASTILY DEPARTS WHITE HOUSE, ENDING CRISIS." 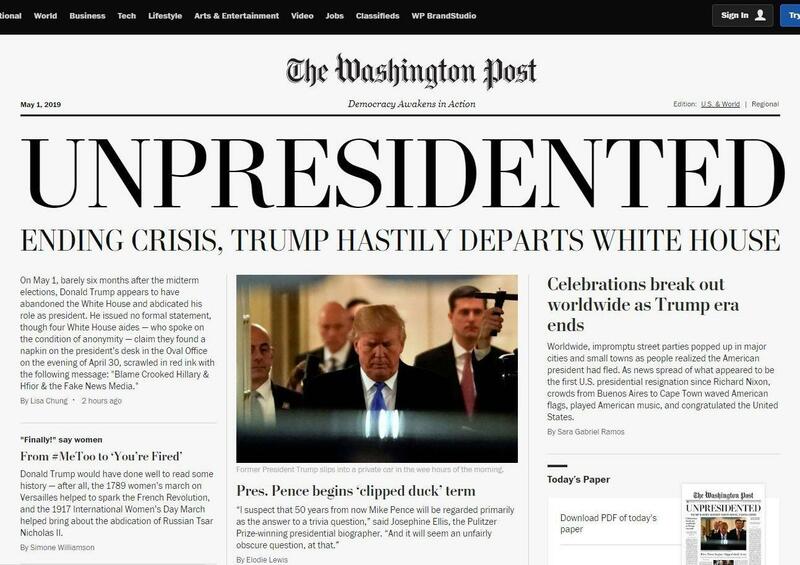 That shocking story was delivered on crisp newsprint to commuters around Washington, D.C., on Wednesday under what appeared to be the signature banner of The Washington Post. Online, a website bearing an eerie similarity to the Post's described a secretive resignation, global celebrations and the swearing in of Mike Pence as president. "They are not Post products," they said in a statement. The bona fide Post also published a story about the fake stories. Inside the satirical version of the paper, a special pullout section titled "Bye-bye: A Guide To Bringing Him Down" pointed to the source of the publication. "This paper is a dream; it's not a deception," said anti-Trump organizer L.A. Kauffman in an interview with NPR. She said she created the fake paper in collaboration with author Onnesha Roychoudhuri and the activist pranksters known as the Yes Men. "It's a vision of a women-led popular uprising that drives Trump from office by May 1," Kauffman told NPR, noting that the paper, as well as the online stories, all bear that date. Their publication paints a picture of an America transformed by jubilant left-wing activists whose protests forced the president from office. Kauffman, who admitted the project was a "completely unauthorized" edition of the renowned paper, said they had been planning the distribution for nine months and wanted to tie its release to the upcoming Women's March. "We were very careful to date it in the future and frame it, essentially, as speculative fiction," she said, but she admitted that people might be confused by how closely it imitates the real thing. "I certainly hope that people get a moment of joy in the period before they realize it's a dream projecting into the future," Kauffman said, adding that she sees the project as part of a long-standing tradition of political satire. And that tradition includes spoofing newspapers. In 2008, the Yes Men claimed responsibility for releasing more than 1 million fake copies of the New York Times that falsely reported the end of war in Iraq. This week's fake publications, however, spread through a Washington (still) led by Trump, who has repeatedly denounced the Post and other news outlets as "fake news" without providing evidence for his claims. Kauffman told NPR early Wednesday afternoon that she hadn't yet heard from the real Post's legal team or been asked to take down the fake website. She said they don't currently have plans to distribute the paper elsewhere in the country. Amid the ginned-up stories in Wednesday's falsified Post, readers noticed a self-referential piece whose headline hinted at the organizers' hope for the project: "Fictional Washington Post eerily predicted real events."